Nowadays we think of curiosity as an emotion necessary for the advancement of knowledge, indeed as the well-spring of scientific discovery. It was not always so. No difference between gawking at freaks in a sideshow and making investigations in natural philosophy? That’s what the saint said: “From the same motive,” Augustine wrote, “men proceed to investigate the workings of nature, which is beyond our ken—things which it does no good to know and which men only want to know for the sake of knowing.” Augustine’s severe judgment of intellectual curiosity, linking it with the sin of pride, the black arts, and the Fall, became conventional in medieval thought. In the Renaissance, it gave rise to such memorable characters as Doctor Faustus, who bartered his soul to the devil to satisfy his insatiable curiosity and quest for power. ...Venice’s maritime empire and its rich craft tradition provided plentiful fuel for wonder and curiosity. The continual contact with exotic commodities, whether herbs from the New World, mechanical toys from Persia, or fake dragons and basilisks, fueled Renaissance curiosity. All that evoked curiosity and wonder became prized objects for collectors, who displayed rare and exotic natural and artifical objects in curiosity cabinets, like peacocks proudly displaying their colorful feathers—indeed, peacock feather, too, were prized objects for collectors. Pharmacies displayed the curiosities of Renaissance culture. The cabinet of pharmacist Francesco Calzolari at Verona, pictured here, displayed dried herbs, minerals, preserved animals, birds and snakes, including a supposed unicorn horn. The transformation of curiosity in the Renaissance was a precondition of modernity. Without curiosity, there can be no scientific discovery, and without discovery, there can be no new knowledge. You can read this piece in its entirety--and find out more about William Eamon and his work-- by clicking here. 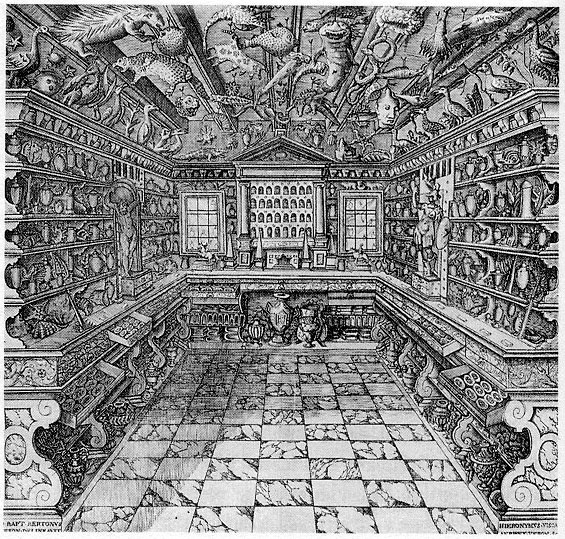 Image caption: Pharmacies displayed the curiosities of Renaissance culture. The cabinet of pharmacist Francesco Calzolari at Verona, pictured here, displayed dried herbs, minerals, preserved animals, birds and snakes, including a supposed unicorn horn. I know my curiosity has gotten me into a bind a time or three.